Martina McMahon played with conviction and purpose from the first ball in the world championship final, building a 13-3 lead on Casey by overpowering the WR48 #1. McMahon pushed Casey into survival mode in virtually every rally during the first half of the first game, with Casey just hoping for McMahon errors to win rallies. Casey rallied behind a great power serve to close the gap, striking seven ace serves and earning first-strike opportunities to dictate rallies to close the gap to 15-18. Casey would close to within two at 18-20 but was never able to catch McMahon, as McMahon took a one-game lead. The first half of game two closely resembled the second half of game one, as McMahon and Casey played evenly en route to a 12-all tie. McMahon composed herself for a final push at 12-all, swinging freely and confidently to score the final nine points of the match to earn her first 4-Wall singles world title. With the championship, McMahon became the first player in World Championship history to win the Wall Ball Open Singles and 4-Wall Open Singles. McCarthy and Nash successfully defended their world title, dominating the action against the defending 3-Wall and 4-Wall national champions Sean Lenning and Marcos Chavez. McCarthy and Nash controlled the action throughout the match, just as they had done throughout the event. After dominating game one, McCarthy and Nash withstood a Lenning rally late in game two to hoist the crown for the second time. “I would put Robbie and Diarmaid against any doubles team in the history of the game,” declared Dave Vincent. “I don’t know if I’ll be back in three years but I’m happy to win this one anyways,” stated McCarthy. McMahon continued her stellar play in the doubles, as McMahon and two-time world championships singles champion Aisling Reilly overwhelmed WR48 #1 Catriona Casey and Aisling O’Keeffe. Reilly and McMahon cruised in game one, built a big lead in game two, and closed out the match with three consecutive one-inch high kills. 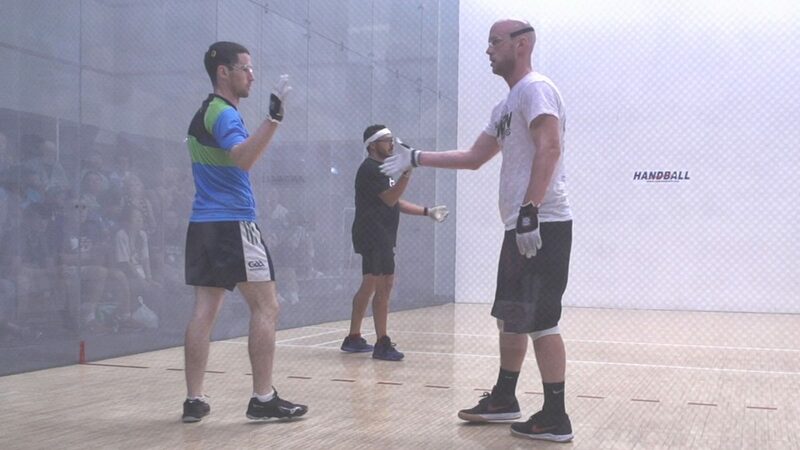 With the doubles championship, McMahon completed the World Championship “Triple Crown,” winning the 4-Wall singles and doubles and the Wall Ball singles. “The Triple Crown will likely never happen again so this is truly history,” stated Vincent. Editor’s Note: Martina McMahon is the current World 4 Wall Singles & Doubles Champion, USHA 4 Wall National Singles* Doubles Champion, World 1WallBall Singles Champion, All Ireland 4 Wall Singles Champion and World Outdoor 3WallBall (Small Ball) Champion, to name just a few! 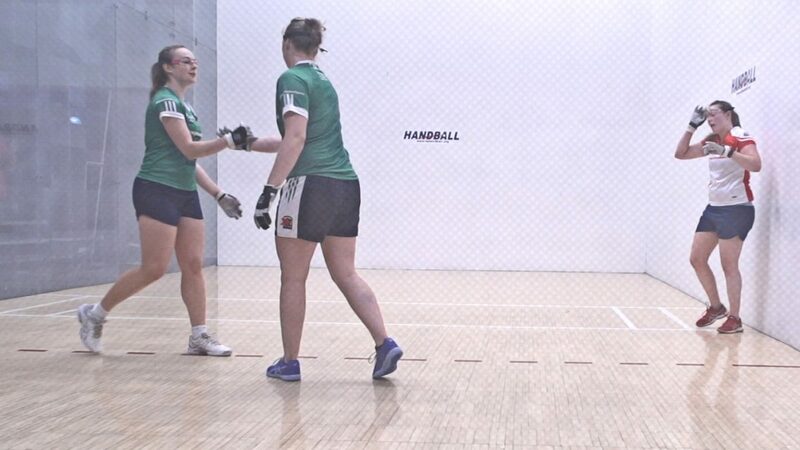 The 2018 World Handball Championship has finished with today being another fantastic day for the Irish in Minnesota with Limerick’s Martina McMahon winning her first World 4-Wall Open Ladies Title. In doing so she becomes the 1st woman ever to slam both the 1-Wall and the 4-Wall World Championships!!! Also taking home gold today was the Men’s Senior Doubles team of Robbie McCarthy and Diarmuid Nash and the Ladies Senior Doubles team of Martina McMahon and Aisling Reilly. The Ladies Senior Singles final was a repeat of the Irish Singles Final that was played last March in which Martina McMahon won by a single ace and that win confirmed her position as Ladies Team Captain for these Worlds. In the opening game today McMahon took an early 8-2 lead as Catriona Casey seem very nervous at the start. McMahon extended her lead to 10-2 but Casey played her way into the game and was only 2 aces down as she trailed 15-17. At this crucial stage McMahon restored her advantage to 20-15 but it took six chance before she got over the line to win the first 21-18. The second game started in a similar fashion with McMahon again starting well by leading 5-0 but Casey really upped her game and just trailed 4-6 a short time later. There was only ever a couple of aces between both girls until the scores were level at 12 all. The game was at a pivotal point at this stage but McMahon with an ace took the initiative and went 16-12 up. Casey got into serve but did not score. When McMahon returned to the service box for the next few minutes the large crowed witness some of the best serving that has ever been seen in the Ladies game as McMahon with 3 aces and 2 kills closed out the game and the match 21-12 to win her first 40×20 Senior Singles World title. McMahon followed up her stunning singles win by then teaming up with Antrim’s Aisling Reilly to take the Ladies Open Doubles title this afternoon. McMahon/Reilly defeated Catriona Casey/Aishling O Keeffe 21-5, 21-15 to take the title for the second time. Earlier in the day Westmeath’s Robbie McCarthy and Clare’s Diarmaid Nash won the Men’s Open Doubles title also for a second time with a two game victory over the American’s Marcos Chavez and Sean Lenning. The first game was hotly contested but the Irish combination dominated most rallies and took the first 21-7. In the second game, McCarthy and Nash stormed to an early lead, which the men from the states were unable to claw back, eventually going down 21-14. The Juvenile Team Ireland members also had a wonderful world’s with many medals on the way home to Ireland tonight.